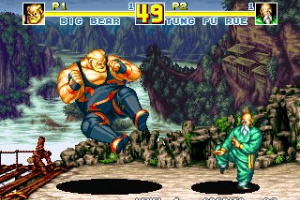 Originally released in 1993, this fighting game pits 15 different fighters against each other. 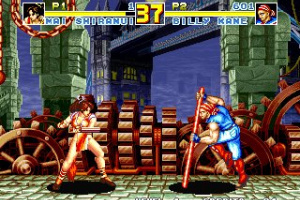 The cast includes the original eight characters from Fatal Fury 2, as well as three new characters (Billy, Axel and Laurence) and a new boss (Wolfgang). Also, three characters from the original Fatal Fury (Duck, Dan and Geese) have returned to the fight. Building on the appeal of the previous game with two-line battles, special moves and powerful finishers, this game is truly worthy of its “special” distinction. And if certain special conditions are met, special guest Ryuu Sakazaki will make an appearance. I never got into fighters, they looked cool and all, and they were kinda fun, but I could never get into them. Would this be a good game to start with? If not, what would be? All we need now is World Heroes Jet to make the first two World Heroes games obsolete. Yey! I had a feeling someone would mention that. SSB is a completely different beast from the likes of Fatal Fury and Street Fighters, and should not be considered an entry level fighter parse, sinse tactics used in SSBB don't really work in most 2D fighters. Trust me, I've played and exceled(though that is a bit strong of a word) in all of the Super Smash Bros. games, yet I can't even begin to concieve the complexity of these games. I need something that doesn't have an entirely extensive list of moves, yet still plays like a regular fighter. What I'm asking is, what would be a good transition game(from SSB to Street Fighters). So is this the same as Fatal Fury 2? I might give this a download since i kinda like the Fatal Fury games fro some reason even if they are the early editions. Thank you Surgical Precision! I always wanted to try fighters, but most were far too complicated, so I really needed that. Now if my brother will let me try that Street Fighters game he's got, I'll be able to add another genre of games to my repetoire. 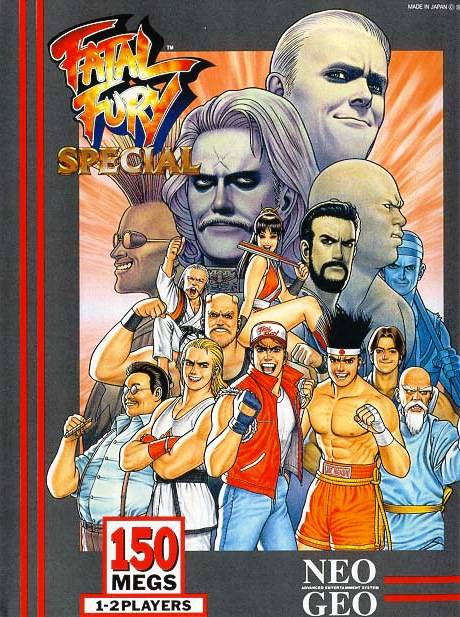 Isn't this one of the best Fatal Fury games? 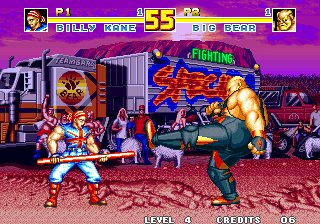 It has Billy Kane playable, Finally! 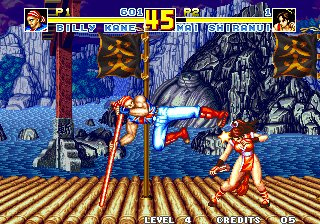 According to reviews this is one of the better Fatal Fury games, so I really hope it comes to Europe as well! Since we´ve gotten every Neo Geo game so far, my hopes are high. I guess the Real Bout Fatal Fury series and Garou are even better, but since this peaks the "regular" series it´s a must buy for me! I tried that Street Fighters rom, it was pretty fun, once I found a good faq. I would've tried this one, if I could've gotten the dang Neo Geo emulator to work. I really think if I keep on trying, I could really get into fighters, though, at the moment, they do seem a little overwhelming, and I'm not used to putting so much work into a game. I'm not sure though, should I go with Street Fighters, or Fatal Fury - I've already put some work into SF, but FF has those two really cool guys from King of Fighters '94. I suppose I'll go with both eventually, but really, I need to decide which one I should get first. Any of the later KoF games are great but they (Even on the easiest difficulty setting) make most other fighters look down right easy by comparison! 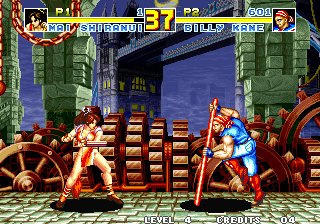 Actually Fatal Fury 3 is by far the best in the regular series. 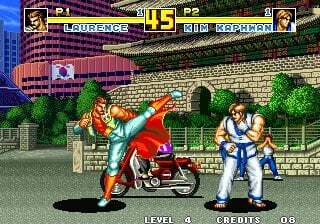 Then the Real Bouts took Fatal Fury to the next level. 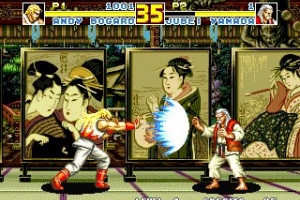 The Garou just pretty much destroyed almost every 2D fighter ever created (except Last Blade ). 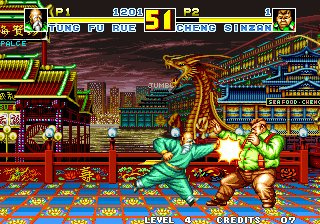 Street Fighter is a much more easier fighter to get into. 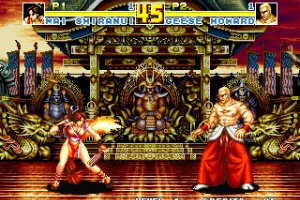 Once you get use to those, you can upgrade to one of the better fighters on the Neo Geo. If you are just getting into fighters though, stick to Street Fighter for the time being. Thank you everybody for your opinions, I appreciate it. 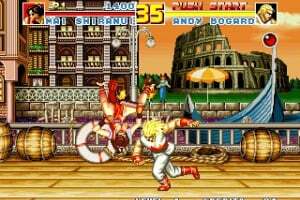 I think I'll go with Super Street Fighters II: The New Challengers (since that was the rom I had been playing) the next time I buy a VC game, Even if this does have Joe and Terry from that King of Fighters game I played. 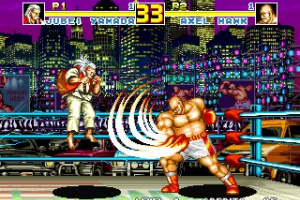 Give me Windjammers and I'll be happy. I just realized this was released on XBLA like, a year ago. That might explain why it was rated already. It'll still probably come to VC, but...come on! Well youre right that it was rated already, but it was only recently that it was rated specifically for Wii. I was just about to ask how this compared to the rest of the series, since the collections are pretty cheap nowadays. I'll try to pick them up when I can. Edit: Actually, I find FF Special to be the best in the main series. I didn't like the new characters in FF 3, and really missed the old ones. The 3-plane system offered nothing, and I didn't like that you could only fight on the main plane. 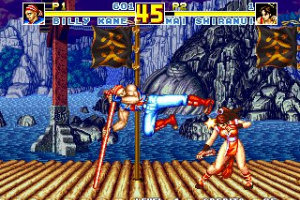 Keep in mind that most SNK collection have crappy emulation. @ Adroitone when you say SNK volume collections do you mean the Wii version or the PS2 version? I heard Fatal Fury Volume 2 was better than most of the other compilations, and since that's the one I'm interested in anyways, I don't see that as much of a concern. The Wii collections are pretty good, at least that's what I heard, but the PS2 versions tend to have glitches. Decent looking fighting game. I'm just not that interested. Why? 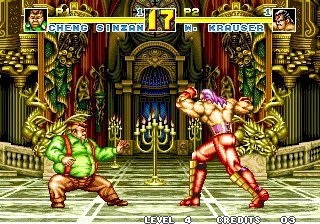 Because I'm getting SNK Arcade Classics very soon. Fighting games was the Neo-Geo's speciality. They make up way over half its catalog. I enjoy fighting games myself but I won't be getting this one. Its dated. I' am probably going to download this one when it comes out. None of the other games that're in FFBA Vol. 1 interest me, except for maybe Fatal Fury 3. 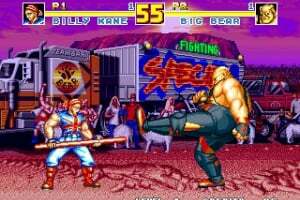 What's so bad about Neo Geo fighting games? Are you just mad because neither majora's mask or Earthbound is in the vc yet? 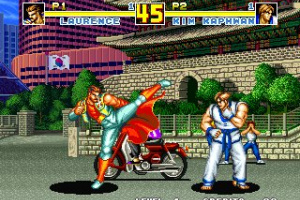 Fatal Fury Special isn't on the SNK Arcade Classics collection. 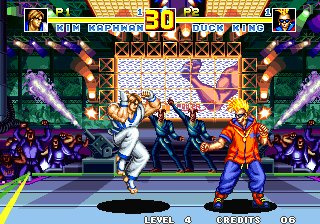 my favorite fighting series (besides smash bros) is the king of fighters series and since this game doesnt have ralf, then i anit getting it! I played a demo of this on X-Box 360... its quite terrible. Better than AoF though. 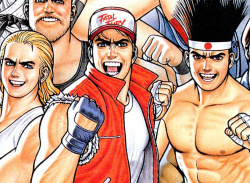 Real Bout Fatal Fury renders Fatal Fury 3 obsolete. Its much easier to maneuver the three planes in Real Bout. The only advantage FF3 has over RB is the character specific backgrounds. 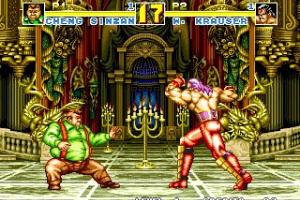 I wonder what's holding back SNK Playmore from putting out any more Neo Geo games on the VC? I think the VC will probably start getting more Neo Geo games once Fatal Fury Special or World Heroes 2 comes to the VC. It's back?! They even kept the old comments. Not interested though since I am horrible at all fighting games. From looking at the character roster, this might be my 2nd Virtual Console game that is fighting if the game is as good if not better then Super Street Fighter II: The New Challenger. As good as SSF2? While I wouldn't go exactly that far, it's pretty damn close, yeah. Definitely one to download if you want another fighter. 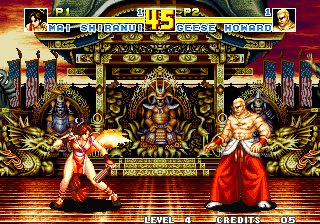 This is the last of the early Fatal Fury games. After this one, the series got more interesting. I still haven't downloaded a Fatal Fury game yet. I think my first will be Real Bout. I love Krauser, him and Terry are real neat. Best Fighting game of all time. 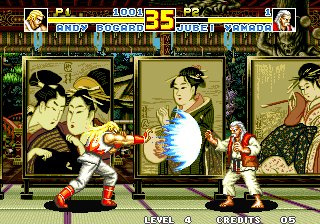 Already have it on 360, but it's always nice to see more Neo Geo games added to he Virtual Console. Here's to hoping for more, rarer titles! I would recommend getting this game and skipping FF3 all together because FF3 has a new engine that has been improved with Real Bout. @morphballer: thanks, that´s the answer i search. Then the special is the best, and later go with real bout because improves the ff3 mechanic. OR, if you have a PS2, you can just get FF Battle Archives 2! It comes with all three Real Bout games. Yay Fatal Fury 2 is obsolete Yay.